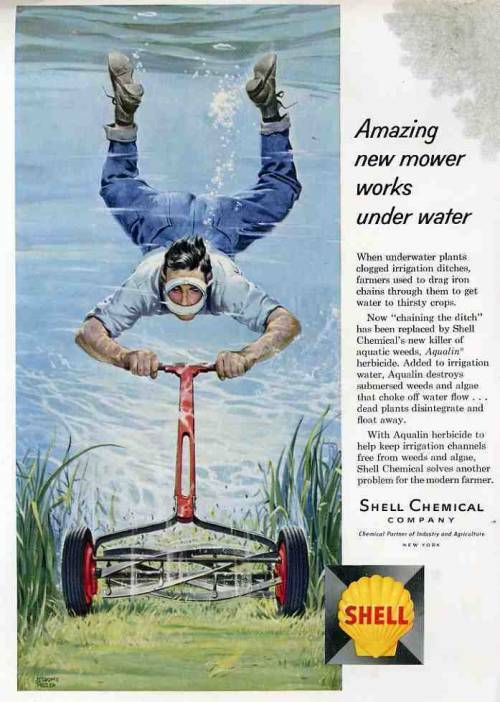 May, 1960 advertisement in Scientific American for Aqualin, a new underwater herbicide produced by Shell. Aqualin, now discontinued, was 92% Acrolein, used as a chemical weapon during World War I and banned since 1992 via a United Nations arms control agreement. This entry was posted in Front Page and tagged advertising, aqualin, chemistry, environment, herbicide, Posthorn, Repost, science, shell, tech, Tumblr on 21/02/2012 by John.